Depeche Mode have shared their comeback single ‘Where’s The Revolution’. It marks the band’s first new release since the album ‘Delta Machine’ in 2013. You can listen to the new single below. Their forthcoming LP ‘Spirit’ will be released on March 17, and was produced by Simian Mobile Disco’s James Ford. 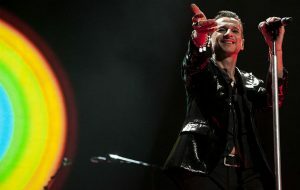 Frontman Dave Gahan also spoke about the new record and said the US election affected the outcome. He also spoke for the first time about David Bowie’s death. Gahan said the band recently paid tribute to the late icon during a concert at New York City’s High Line public park, which saw the band perform a series of tracks from their new album and a cover of Bowie’s ‘Heroes’. Depeche Mode announce the Global Spirit Tour and upcoming album ‘Spirit’, live from Teatro dell’Arte at La Triennale di Milano. More details about the tour at www.depechemode.com. Depeche Mode’s full upcoming 2017 tour dates are below – including a huge show at the London Stadium in the capital. The post Depeche Mode share comeback single and open up about new album ‘Spirit’ appeared first on NME.